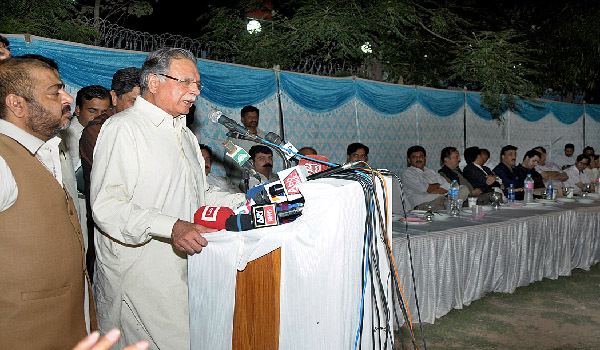 RAWALPINDI June 24, (APP): Minister for Information, Broadcasting and National Heritage Senator Pervaiz Rashid said Friday that in civilized world decisions are made through ballot and not by violent agitation on the streets. Speaking to journalists here at a Sehri event, organized at Rawalpindi Press Club, the minister advised opposition to wait till 2018 and at the time of elections go to the people of Pakistan with their list of allegations against the government. PML-N would come before the people with the list of its services for Pakistan, he said adding then the people would decide whether they accept the opposition’s list of allegations or acknowledge the services of PML-N.
overcome the present shortfall of 3000 to 4000 megawatts. in elections, wanted to create chaos in the country. efforts to overcome energy shortage by end of 2017. He said if progress of the country was stopped by any means it would be a loss for the people of Pakistan and it might obstruct government’s efforts to meet energy needs by building more power plants. desired free press waged the same kind of struggle. in the presence of free media, nobody can derail democracy. difficulties to ensure a free press. He said that future of next generation was linked with democratic system and a developed Pakistan. adding free press and democracy safeguard and protect each other. It was responsibility of journalists to counter those voices which ask what democracy had given to Pakistan, he stressed. the eyes of people of Pakistan, he added. The minister said there were difficulties, but the present government had been taking steps to overcome problems. League (N) from winning the next general election. Pervaiz Rashid said it was media’s responsibility to inform people of Pakistan about prevailing circumstances. people to get a better future for themselves. The minister said Pakistan would emerge as a better, brighter and progressing country in the year 2018 due to efforts of the government. He appreciated National Press Club for organizing family festival for media persons and hoped such activities would continue in future too.